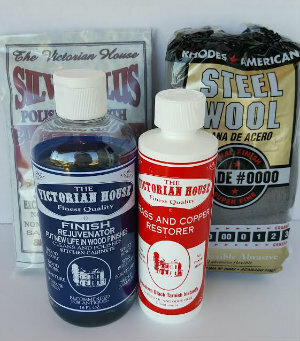 The Victorian House Products for Wood and Metal Restoration. Finish Rejuvenator - The Best Wood Kitchen Cabinet, Antique and Furniture Cleaner and Restorer! Brass and Copper Restorer - Non Toxic. Odor Free. Use right at the kitchen sink..Dissolve tarnish and rinse it away. Silver Plus Buffing Cloth - Clean Silver, gold and jewelry with no mess and not odor. Non Toxic. 1 Wood Rejuvenator. Clean/Restore-kitchen cabinets, furniture, antiques. Remove Grease Buildup. Results Last Years. 1-Brass &Copper cleaner. Dissolve tarnish and rinse it away. No Odor, No paste mess. 2 Bottles Brass and Copper cleaner. Rinse tarnish away. 12 pk. steel wool. 2 Pack Kit. Kitchen cabinet / wood cleaner and restorer & 12 pk. steel wool applicators. 5 Products- 2 Kitchen Cabinet Cleaner and wood Restorer. 1 Brass Cleaner, Silver Plus & #0000-All 5. 6 Pack. Kitchen cabinets, furniture and antiques cleaner and restorer. Finish Rejuventor.